I'm reading about a microprocessors at the moment and wondering if I could get started with an 8-bit microprocessor. What would I need to get started. I understand that they need external RAM and ROM. I don't know whether it is still possible to get an Intel 8-bit one as my book is from 1980. So are there any other recommendations?. I am looking for the circuit diagrams for creating my own PCBs, is this advisable? Something like a single board computer is what I'm looking for. What are your design requirements or goals? Any areas you expect to need to learn more about, or any areas you wish to focus on? Because most of the Intel 8-bit microprocessors were so popular they are fairly easy to find as New Old Stock (NOS) or Pulled/Refurbished (reclaimed/recycled, usually tested). At least the 8080, 8088, 8086, and 8085 are available from distributors or obsolete / old-stock supplies. Two others that are worth considering would be the Zilog - Z80 (technical description), and MOS Technology 6502 (technical description). The Z80 was created by Federico Faggin, who designed Intel's 8080, and made the Z80 a binary compatible (but enhanced) processor. The Z80 requires fewer support chips than the i8080 with built-in DRAM refresher, a single (5V) voltage supply requirement (i8080 required +/-5V and +12V), and can be run at any clock speed up to its specified speed (e.g. 2.5 MHz for the first NMOS models). Combined with 5V power supply, oscillator clock (e.g. TTL/CMOS oscillator "can"), Static RAM (rather than Dynamic RAM, DRAM) you only need a ROM/EPROM/EEPROM and interface (e.g. interface chips for parallel or serial interfaces) to built a minimal microcomputer. One fairly popular book on building your own microcomputer using the Z80 was Build Your Own Z80 Computer (available with copyright permission of author/publisher) by Steve Ciarcia. Also check out the (dated) alt.comp.hardware.homebuilt FAQ, and the N8VEM community for additional resources and references. The MOS 6502 was the another popular microprocessor, in part because it was so much cheaper ($25 USD) than the Motorola 6800 which was originally $300 USD circa 1975. It was used in popular systems such as the Apple I from Apple Computers, Commodore KIM-1, PET, and Vic-20, BBC Micro, and the Commodore 64 and Atari 2600 game system used 6502 derivatives (6510 and 6507). So there is a lot of material available from retro-computing and retro-gaming people online, and parts. The 6502, like the Z80 was produced by several sources (i.e. second sourcing) including Rockwell in additional to the primary designer / manufacturer, MOS Technology. If you have a particular (strong) interest in the x86 or IBM PC / XT history then a 8088 or 8086 might be a educational target to consider. Otherwise I would lean towards the Z80 as my first pick, and the 6502 as my second choice due to parts availability and resource material availability. The range of options is unlimited from a microcomputer built from almost exclusively discrete transistors, to a 25MHz 32-bit MC68030 workstation. if you prefer intel CPUs - something like this based on i8085 - you can download Hex file monitor program, PLD's JEDEC file and Complete Hardware Schematic. If you want to play around with an 8 bit cpu, the z80 and 6502 are probably electrically the least complicated, as they present non-multiplexed buses, operate from a single 5V supply, and don't require multi-phase clocks. Older chips like the 8080 or the 6800 need multiple supply voltages. The 8035 and 8085 multiplex address and data, requiring you to supply an external register to latch part of the address bus. The 6809 has more powerful instructions, but the single clock 6809 variant is harder to find than the quadrature-phase clock 6809E. The only real reason to build an SBC around one of these is for the fun of it. 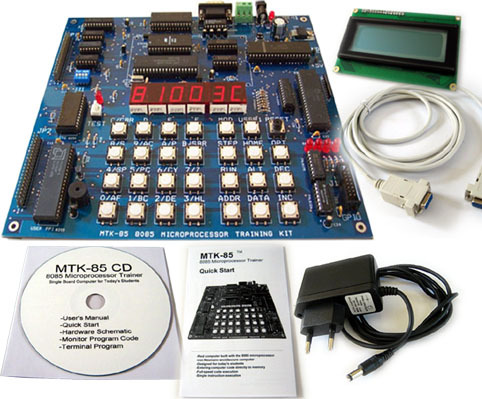 A system based on a modern microcontroller will be smaller, use less power, and out-perform the old dinosaurs in terms of instruction set and integrated peripherals. I have a few simple PCB designs here for a variety of MCUs. Some of the chips have been superseded, but there are current devices that will drop straight in. Appropriate programming and debugging tools will be needed, they are available quite cheaply from the chip manufacturers. Start by getting a more current book. Lots have changed, for example current microprocessor shave memory controllers on board. Then buy (don't build) a SBC, similar to as @jet suggested. And you may just want a higher-end microcontroller rather than a microprocessor. Whatever you do, start with a higher level language like C. I know you would learn more about the internals with asm, but if you want to get something done in a finite time asm is usually not the best route. And look at the cost of the compiler ( and other tools ) in making price comparisons. The CMOS 6502 (65c02) and 65816 are still in production today, with no end in sight, made by Western Design Center (http://www.westerndesigncenter.com/). They are conservatively rated for 14MHz and have many hardware and software enhancements over the original MOS 6502. There is a huge amount of support for them at 6502.org and forum.6502.org. I have a 6502 primer at http://wilsonminesco.com/6502primer/index.html in 22 chapters covering address decoding, memory-map requirements, interrupt connections, 74xx logic families and timing margins (plus "Do I need bus transceivers? ", and static-handling precautions), clock generation, reset circuits, what to do with the "mystery" pins, construction for good AC performance, expansion buses and interfaces, getting more on a board, answering wire-wrap questions and doubts, "What about custom PC boards? ", I/O ICs (plus extra info on 6551 ACIA clocking options), displays, where to buy 65-family parts, general steps for a successful project, program-wiriting: "Where do I start?" (and what to put in your .asm file), debugging, programming tips (some affecting hardware design too), basic workbench equipment, and a potpourri of circuits to interface real-world stuff. Happy building! I suggest you just start browsing relevant questions on the site. There are lots of options for 8-bit/16-bit microcontrollers out there, and they don't typically require external memories (though this depends on your application I suppose). Popular microcontrollers with good development tools out there today are Atmel AVRs, TI MSP430s, and Microchip PICs. Not the answer you're looking for? Browse other questions tagged microprocessor or ask your own question. What's the difference between a microcontroller and a microprocessor? Where can I find an 8086 chip? Where to simulate and test Microprocessor designs? What multi/many-core (micro)processors/controllers should I use for “embarrassingly parallel” computations? What are the required parts for an 8-bit computer? Finite State Machine Handling Timers Gracefully?